The original Rom-Com couple, Beatrice and Benedick, face off in a hilarious battle of wits in this American Stage take on Shakespeare’s famous romantic comedy about the war between the sexes. As World War II is drawing to a close, one woman rails against the roles expected of women of her era while one man is just returning home from the war and in no hurry to be tied down. Who needs love? Full of music and dance, and set against the backdrop of the Florida Keys’ bright sunshine, this exuberant and festive play reminds us that no one is immune when it comes to matters of the heart. The magic of Shakespeare’s continues for ONE NIGHT ONLY with Shakespeare’s Lovers on November 26 . Click on the image below for details. BLUE STAR THEATRES program. Click below to learn more and see the special offers. Matt Acquard (CLAUDIO) is beyond excited for this opportunity to be performing again with American Stage. Matt was seen previously as Sketch/Ensemble in HAIRSPRAY, Laurence/Agent Sharp in TARTUFFE, and Red in AMERICA: A MOSAIC (American Stage). Other credits include: Oberon in A MIDSUMMER NIGHT’S DREAM (Finalist for the Kennedy Center American College Theatre Festival Irene Ryan Acting Scholarship- Region 2), Judge Turpin in SWEENEY TODD, and Sir Toby Belch in TWELFTH NIGHT. Matt will also be seen in Iron Crow Theatre’s THE LARAMIE PROJECT in June. Education includes: BFA in Acting from Towson University, and the American Stage Acting/Apprentice Program. Matt would like to thank Stephanie and Ben for this opportunity, his girlfriend for constantly reminding him of the good and beauty there is in life, and his friends and family for their constant love and support. Juliana Davis* (MARGARET/VERGES) is thrilled to be back at American Stage after last being seen in INFORMED CONSENT and THE 39 STEPS. Credits include: COLLECTED STORIES (Hippodrome), HOUSE OF BLUE LEAVES (Arvada Center), SHEAR MADNESS (Florida Studio Theatre), THE ELEPHANT MAN (Hippodrome), THE TAFFETAS (Denver Center), WEST SIDE STORY (Central City Opera), MOTHERHOOD THE MUSICAL (GFour Productions), PIPPIN (Arvada Center), LUCKY STIFF (Lake Dillon Theatre Company), THOROUGHLY MODERN MILLIE (Arvada Center) and DOUBT (Lake Dillon Theatre Company). Stephanie Gularte* (BEATRICE, Producing Artistic Director) joined American Stage in 2015 and directed the company’s productions of THE INVISIBLE HAND, GOOD PEOPLE, INTIMATE APPAREL, and THE 39 STEPS. In 2004, she founded Capital Stage in Sacramento, CA where she was the Producing Artistic Director for nine years. She has been recognized with the Arts Innovation Award from the Sacramento Community Regional Foundation, the Arts Management Excellence Award from the Arts & Business Council, and in 2014, she was presented with a proclamation from the City of Sacramento, honoring her years of service to the arts in the region. Stephanie performed on stages in California for many years appearing as the title characters in THERESE RAQUINE (Aurora Theatre), HEDDA GABLER (Capital Stage), and MARY STUART (Shotgun Players), as well as lead roles in productions that include TWELFTH NIGHT, THE BLUE ROOM, FOOL FOR LOVE, THE SHAPE OF THINGS, MAPLE & VINE, ONE THOUSAND AND ONE ARABIAN NIGHTS, ROMEO AND JULIET, among others. Stephanie was selected as the best actress of the year, multiple years, by both the critics and readers of Sacramento News & Review. She holds Bachelor of Arts degrees in Theatre and in Government from CSU Sacramento, and an MFA in directing from University of Idaho and has been a member of Actor’s Equity Association since 2001. Visit www.stephaniegularte.com. Lisa Kay Powers* (ANTONIA) was last seen at American Stage in 2.5 MINUTE RIDE. Other acting credits include: Adult Female in SPRING AWAKENING (freeFall Theatre), Natasha in THREE SISTERS, Mariana in MEASURE FOR MEASURE, Widow of Florence in ALL’S WELL THAT ENDS WELL, Mrs. Candour in THE SCHOOL FOR SCANDAL (Shakespeare Theater of New Jersey), Myra/Myrna in THE MINEOLA TWINS, Lucy in DRACULA (Hippodrome Theater). Other American Stage credits include: Dora in THE SWAN, Rachel in RECKLESS, Sheila in THE BOYS NEXT DOOR, and Viola TWELFTH NIGHT. Michael Raver* (DON JOHN) Off-Broadway credits include: THE PERSIANS (National Actor’s Theater), DEATH COMES FOR THE WAR POETS (Sheen Center), VIEUX CARRE (The Pearl), JULIUS CAESAR, ROMEO & JULIET (Aquila). Select regional credits include: Bay Street, Orlando Shakespeare, Playhouse on Park, Ivoryton Playhouse and Telluride Theatre. Film & TV credits include: How We Built the Bomb, Dark Places, Gone Away, TURN: Washington’s Spies, Emergency Contacts, and Gray Matters. As a writer, Raver’s adaptation of THE PICTURE OF DORIAN GRAY was produced by Sonnet Repertory Theatre in 2012. His play, FIRE ON BABYLON, was nominated for The Chesley/Bumbalo Foundation Award, and was named a semifinalist for The O’Neill Conference in 2015. His play, QUIET ELECTRICITY, was named a semifinalist in 2017. His play, EVENING, was a two-time finalist for Red Bull’s New Play Festival. He served as a judge for the Ferro-Grumley Award for LGBT Fiction and regularly contributes pieces to Classical TV, NYC Monthly, Hamptons Monthly, Playbill, Dance Magazine and The Huffington Post. Margee Sapowsky (HERO) recently received Creative Loafings 2017 Best of the Bay award for her portrayal as the title role in SYLVIA, (Early Bird Dinner Theater). She’s won local theater awards for her performances as Van’s Sister in DOG SEES GOD: CONFESSIONS OF A TEENAGE BLOCKHEAD (West Coast Players), Corie Bratter in BAREFOOT IN THE PARK (Francis Wilson Playhouse), Janet van de’Graff in THE DROWSY CHAPERONE (Eight o’clock, Theatre), Lois Lane in KISS ME, KATE (St. Pete City Theatre), & Janet Weiss in THE ROCKY HORROR SHOW (Island Community Theater). Andrew Vertucci (BORACHIO) is very humbled to be making his American Stage debut this season. Andrew just recently graduated with a BFA in Acting from SUNY Fredonia. Most recently seen as Danny in DANNY AND THE DEEP BLUE SEA, Matt in DOG SEES GOD, George Bailey in ITS A WONDERFUL LIFE, and Mitchell Green in THE LITTLE DOG LAUGHED. Television credits include The Affair on showtime and Kilos. If you like Andrew’s antics follow him on Instagram @toochpacshakur. All love to his family and friends, without them he would not be whole. Praise to Ted Sharon, Robin Allan, David Kramer and God, without them he would not be here. Brock D. Vickers (BENEDICK) is an actor, playwright, and improviser who can be seen on stage and screen and is proud to be making his debut with American Stage. Recent credits include MUCH ADO ABOUT NOTHING, CYRANO DE BERGERAC, and RICHARD III (Texas Shakespeare Festival). He is a Company Member of Hedgerow Theatre Company where he has been seen as Bullshot in BULLSHOT CRUMMOND, Man in ON THE VERGE, Charles II/William in OR, Rosencrantz in HAMLET, Fool/Sampson in DON QUIXOTE, and Florindo in THE SERVANT OF TWO MASTERS. Brock holds duel degrees from Georgia Southern University and has trained with ComedySportz, Pig Iron Theatre Company, the Philadelphia Artists Collective, and the Wilma Theatre. To learn more about Brock and his upcoming projects visit Brockdvickers.weebly.com or follow him @BrockDavin. Richard B. Watson* (DOGBERRY) was most recently seen as Max in THE ROYALE, Selig in JOE TURNER’S COME & GONE, Sumner in the first national tour of CHEERS LIVE ON STAGE, Peter Tchaikovsky in Mozart In The Jungle; Arkansas Rep, Asolo Rep, Pioneer, Sacramento Music Circus, Pittsburgh Public, and Disney World. Shakespeare credits include: MACBETH, PERICLES, HENRY V, HENRY VIII, RICHARD III, KING JOHN, HAMLET, KING LEAR, OTHELLO, TEMPEST, TAMING OF THE SHREW, MERRY WIVES OF WINDSOR, AS YOU LIKE IT, TITUS ANDRONICUS; John Adams in 1776, Henry Higgins in MY FAIR LADY, Zach in A CHORUS LINE, Long John Silver in TREASURE ISLAND: A NEW MUSICAL, Applegate in DAMN YANKEES, George in WHO’S AFRAID OF VIRGINIA WOOLF?, CP Ellis in THE BEST OF ENEMIES, Sherlock Holmes in SHERLOCK HOLMES & THE WEST END HORROR, James Lawson in RACE, Squeers/Hawk in NICHOLAS NICKLEBY. Film & TV credits include: PS, I Love You; and Law & Order: Ci. MFA from The Academy For Classical Acting. Tato Castillo (Apprentice Ensemble) was most recently seen in THE WILD PARTY by Andrew Lippa at The Palladium Theatre. His beginnings as a dancer took place in Venezuela during childhood. He moved to St. Petersburg at age 12 and began acting in High School. He served as an intern at American Stage in 2007. In College he went back to his roots as a dancer joining the ensemble for two of the yearly recitals and several musicals. His favorite credits were CABARET and a piece choreographed by Pilobulos Dance Company. He received his Bachelor’s Degree in Theatre Arts from Rollins College School of Theatre and Dance. Kody Hopkins (Apprentice Ensemble) is excited to be joining American Stage as one of its 2017-18 Acting/Production Apprentices. He holds a BFA in Acting from the University of North Carolina at Greensboro, where he performed in a diverse array of plays from school tours to Shakespeare. Some of his favorite shows while there include ASLEEP ON THE WIND, PINOCCHIO, and FROM UP HERE. This will be his first time on an Equity Stage, and he’d like to thank the company for this wonderful opportunity! Tarilabo Koripamo (Apprentice Ensemble), originally from Nigeria, moved to the United States in 2013. She graduated with a theater degree from Guilford College and has been in multiple productions such as RIMERS OF ELDRITCH, by Lanford Wilson, DEAD MAN’S CELL PHONE by Sarah Ruhl, CRUCIBLE by Arthur Miller, and more. Tarilabo is also a recommended certified stage combatant by the National stage combat workshop. She has served as a fight co-director and captain on multiple productions. She is honored to be joining the professional team at American stage Theatre company as an apprentice. Courtney Anne McLaren (Apprentice Ensemble) holds a BA from the Massachusetts College of Liberal Arts with concentrations in theater, music, and arts management. At MCLA, credits include: Sally Bowles in CABARET, Wendla in SPRING AWAKENING, Harper in ANGELS IN AMERICA (PART I), and Clarice in THE LIAR. While in college, she spent summers as an acting apprentice at three renowned New England theaters, Berkshire Theatre Group, Commonwealth Shakespeare, and Williamstown Theatre Festival. Before joining American Stage, she acted as an Artist-in-Residence at Berkshire Theatre Group performing in touring shows, teaching playwriting and acting skills, and leading after-school theater programs. Courtney sends her thanks to family and friends for their love and support. The perfect primer! 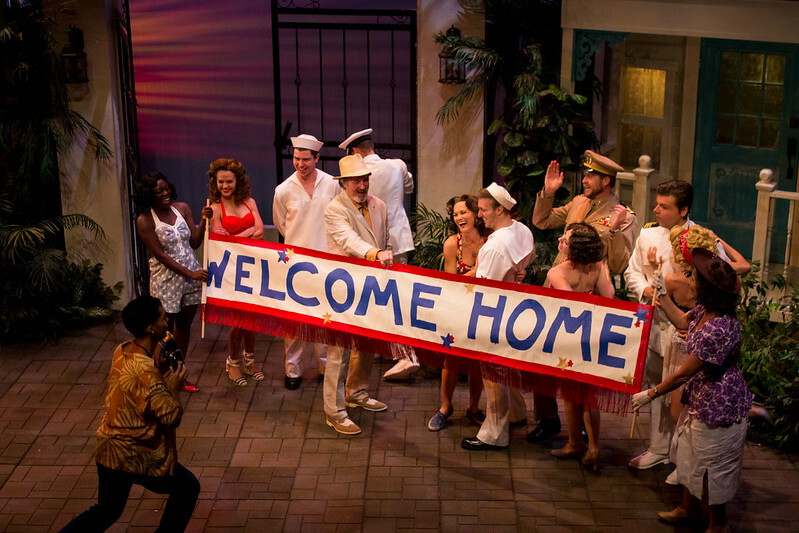 Take a peek behind the curtain before the opening of MUCH ADO ABOUT NOTHING with this informative and entertaining presentation about the play, the playwright, and the American Stage artists who bring it all to life. Professor Emerita Dedee Aleccia will provide relevant details about the history and central themes of the play, while members of the artistic team will give an insider’s perspective on their process. Pricing: $10 for General Public. Great theatre inspires contemplation and challenges our assumptions while inviting us to come together for conversation and a deeper connection. From social and political hot-button issues to ethical dilemmas, American Stage’s Community Conversations dig deeper into the intriguing and sometimes provocative topics explored by our mainstage productions. How far have we come since that time? What does women’s independence mean today? Share your views, hear stories and experiences from local community members, and join the conversation with a special group of panelists who will offer their perspective. Pricing: FREE for General Public. Stick around immediately following select performances to talk with the cast and other audience members while the experience of the play is fresh! Ask questions about the play, the characters, and the process, plus respond to the story and ideas aroused by the production. Free for ticket holders to the performance.